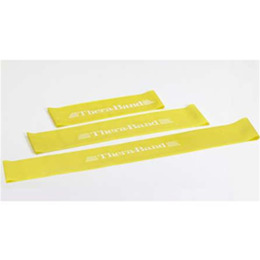 Professional Resistance Band Loops are continuous loop elastic bands in the recognized Thera-Band® color progression. They can be used for a variety of applications, particularly lower body exercises to increase strength and balance. Band Loop resistance is aligned with the resistance level of a regular band tied into a loop. Band Loops are individually poly-bagged and accompanied by safety instructions.